Tobermory is one of those was-mothballed, now-resuscitated distilleries which is now producing a high quality product. It’s considered an island distillery, being on the isle of Mull (north of Islay and Jura, south of Skye), but the style isn’t like what we think of as an island malt. It does not have the medicinal quality of a Talisker or Caol Ila, nor the peat of an Ardbeg, nor the smoke of a Laphroaig or Lagavulin. 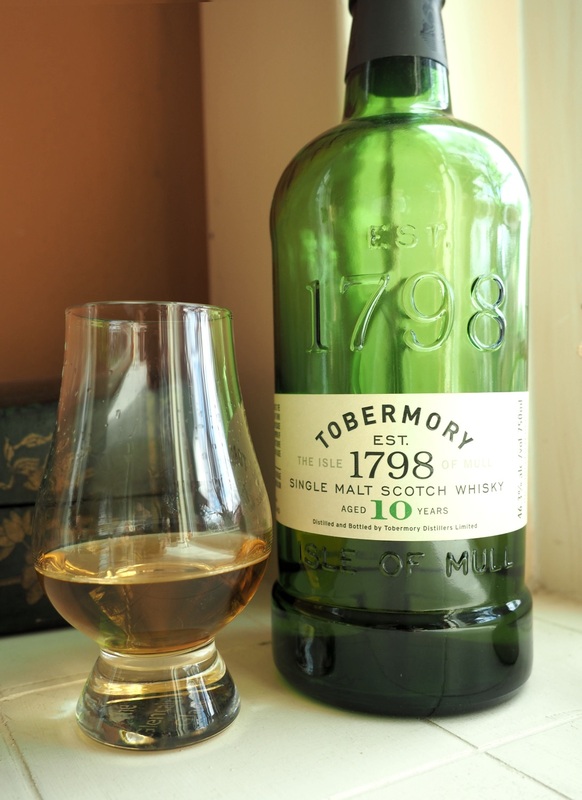 In fact, Tobermory reminds me of a Speyside or lowland malt (as we’ll see, this is no great surprise). Bought in 1993 by Burns Stewart, the Ledaig distillery, as it was known, has since been expanded and sold a few more times. The current owners are embracing the craft expression, with 46.3% ABV and (since 2010) a non-chill filtered finish. I like the former, as I can add water to taste, but frankly I haven’t been amazed nor confounded by the absence or presence (respectively) of chill filtration to date. Others may carry the torch for that battle (and they do). I need a head-to-head comparison to sort that out. I’m a bit more vocal about another subject: colorant. You won’t find e150 here, according to their profile of Ian Macmillan, the master distiller. As you can see from the photos, Tobermory is a very respectable light amber color. Depending on the light, it can look lighter still. It’s a nice change from the ‘spray tan’ effect you get with some larger commercial expressions. As it turns out, although the water is local, I wondered about the malt. There was nothing on the Tobermory website about on-site work at the distillery, so I emailed to ask. A day later, a helpful gent named Finlar responsed “We do not do any malting onsite. We produce more whisky now than the distillery was designed for in 1798 and so we do not have enough space to malt the amount of barley that we require for the volumes of whisky we produce today.” According to Wikipedia, the whisky is not aged on site, due to its tumultuous history; its warehouse was never completed (instead, converted to flats). Finlay confirmed that as well. Instead, the whisky is aged at Deanston, in the lowlands. So the flavors the locality might impart to this this whisky is in the water, from a local loch, and the distillation. They claim some peat flavor from the water, and I’d agree with that, though it is very subtle. According to Wikipedia, some Tobermory production is one of the components of Black Bottle. Probably a younger vintage goes into BB, as this stuff was pretty pricey in my town, about $65 for a bottle. I doubt they’d sacrifice the 10 year old casks for BB. Nose: Honeysuckle, peat, very pleasant earthiness, no smoke. Palate: Lots of gentle caramel sweetness, floral (roses with the honeysuckle), extremely smooth and well-balanced; moderate tannins, peppery mid-palate. Nicely oily mouthfeel. A really luxurious dram. Finish: Pretty long; unctuous sweetness on the tongue, white pepper, the same floral notes hand on a long time, with a bit more rose. There is enough oak tannin to balance the finish, it is by no means overbearing. Bottom Line: Wow, this is a smooth, Speyside style malt that is mated with a gentle island nose. The price is a bit high, especially for a 10-year-old, but this is a damn good 10. For example, there are much cheaper 12 year-old whiskies out there from larger distillers (thought at 1M liters a year, Tobermory is no slouch). One that is in my cabinet is Cardhu, a Speyside malt at about $40 a bottle with a similar, but far weaker profile. In comparison, Cardhu is a ghost of the Tobermory: the cheaper whisky has a touch of the earth on the nose, but a bit flat; not near the same amount of creamy caramel or floral notes on the palate as Tobermory; a watery and quick finish in comparison. I suspect the difference is primarily from the barrels used to age the respective whiskies. I reckoned the folks at Tobermory must be very careful about what barrels they are using (the 10 sees only ex-Bourbon, according to their website). I inquired whether they had a rule about how many fills from were expected from an ex-bourbon cask. Finlay’s response was “We buy our casks from particular suppliers which means that we know what we are getting. The number of fills per cask really depends on the type of cask that we use and what expression of whisky we are using them for.” There you go. For the expensive stuff, you’re likely getting very good wood. This 10-year-old has a large premium in price compared to quite a few 12 year old malts from more famous brands, but I’d say it is worth it if you like a whisky with an unctuous but balanced caramel flavor with a sweet floral finish. One of my benchmarks for the preparation and finish of a whisky is Macallan’s 12. 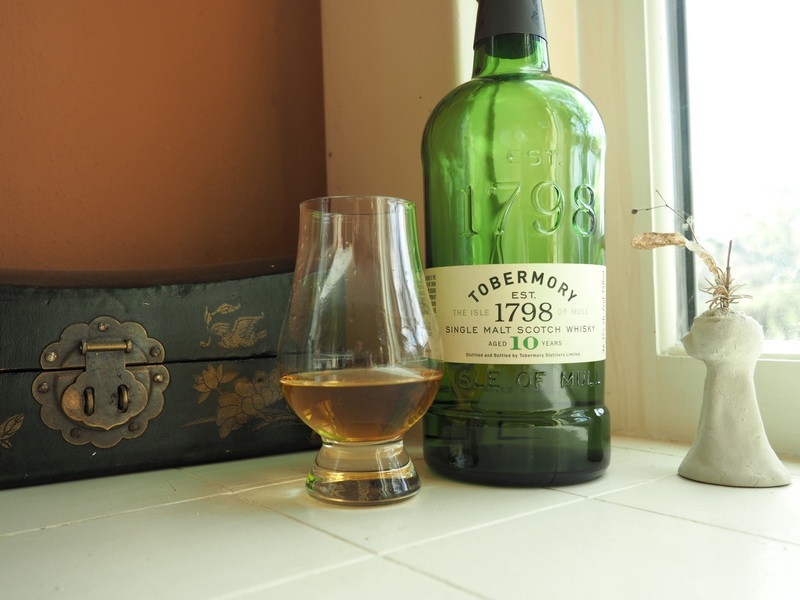 The Tobermory, at about a 25% premium over the Macallan is every bit as civilized, smooth, and balanced. Is it worth the extra coin? The ‘craft’ expression gives it an advantage over the Macallan, and although that counts for me, the main thing is the experience. Macallan is a faultless whisky, it does what it does spot on. But Tobermory has a bit more ‘aha’ in aroma and flavor, especially the finish, so yes, I’d say it’s worth the coin. This was a gift, but I’d buy it again when I’m without another Speysider in the house. This entry was posted in Scotch-single malt, Whisky and tagged Cardhu, Macallan, Scotch, Tobermory, Whisky. Bookmark the permalink. I’ve not got to try the straight Tobermory – we’ve sampled their peated bottling: the Ledaig and enjoyed it – though it is still an enigma for west coast island Scottish whisky. Wow the Ledaig sounds like a real mouthful, which means I’ll probably like it. A bit spendy, though, will have to wait for the holidays, unless a crate ‘falls off the truck.’ The unpeated Tober’ is more likely to be accepted by normal people (who dont brush their teeth with Laphroig for instance). It’s certainly a mouthful to pronounce. Indeed, but I can see why. The variety is astonishing. I had no idea until I started to get into it.